Once you have assessed the project you are about to undertake and established that an extension ladder is the piece of equipment you need the next step is to set it up correctly. Most modern extension ladders are designed with ease of use in mind and if basic common sense steps are followed should present no problems for even a first time user. Since extension ladders are largely used for outdoor work there are several environmental factors to consider before erecting your ladder. If you are using an extension ladder for the first time, familiarise yourself thoroughly with the instructions and check all components are present and undamaged. Never use a damaged or broken ladder. If the ladder is one you have used before, check for any damage or wear and make sure the rungs are clear of any dirt or debris that could cause slipping. Always check you have the safest extension ladder for the job in hand. Before assembling the ladder itself it is just as important to make sure the area you are working in is as safe and secure as possible. This is easily done by observing a few basic factors. Fitness of user – Ladders of any type should never be used by anyone under the influence of drugs or alcohol, or if taking medication which could impair your coordination. People with health conditions causing balance or mobility issues could also be putting themselves at risk using a ladder. Ground surface – Soft or waterlogged ground should be avoided as the ladder could sink into the ground and become unstable. Any loose debris or dirt should be cleared away to prevent slipping and if working on a sloping surface a levelling mat should be used under the ladder and the level of the rungs checked with a spirit level. Avoid setting up on a wet or icy surface as this can cause the ladder to slip away from the wall. Wall surface – Avoid leaning a ladder against broken or crumbling walls as these will not provide adequate support for the weight of the ladder. Also check for ice or water that could cause the top of the ladder to slip. Impact risks – Make sure there is no risk of the ladder being knocked over during use, for example by moving vehicles on the worksite. Try to avoid setting up the ladder over doors or windows that could open outwards and knock the ladder. Electrical risks – Due to the increased height of extension ladders, it is possible that they could come into contact with power lines when being erected or moved. Due to the conductive nature of Aluminium this could have fatal consequences. Weather – Do not use a ladder in snow or rain as the rungs and ground surface can become slippery. In mild windy conditions the ladder should be secured to a solid structure and in strong winds should not be used at all. How to extend an extension ladder depends on the type being used as each type of extension ladder has a different style of construction. Once the worksite has been assessed and deemed safe and the ladder itself inspected for any sign of wear or damage, construction can begin. Two section extension ladders – A double extension ladder consists of two parts, a ladder and an internal sliding section or extension. These have a simple construction are very easy to use. Before using for the first time make sure that the protective rubber bungs are removed. The stabiliser bar can now be fitted to the base of the ladder. Lay the ladder flat on the ground with the sliding section facing up. The bottom rung of the sliding section has two locking clamps underneath that consist of a metal hook that sits on top of the lower rung of the ladder section and a sprung catch that locks it in place. To extend the ladder, simply press down on the catches to release the clamp, tilt the extension towards you slightly and slide the extension up. The catches can now easily move past the rungs of the ladder section. When the desired length of ladder is reached, the catches will automatically clip over the rung of the ladder section and secure the extension in place. The ladder can then be raised and placed at a 70 degree angle against the wall and work can commence. Always make sure the extending section faces out from the wall during use. To retract the ladder, simply reverse the procedure and the catches will lock on the lowest rung, securing the two sections together and making the ladder easy to transport and store. Three section extension ladders – A triple extension ladder, as the name suggests, consists of three parts, a ladder and two extensions. It is similar in construction to a two section ladder and is extended in the same way but extending the upper section first, then the middle section. When fully extended two nylon straps on the sides pull tight, preventing overextension and ensuring the correct level of overlap between sections to keep the ladder strong and safe. When retracted, both extensions lock in place and the smaller profile makes it even easier to transport and store. The top section is also detachable, giving a short one piece ladder for work at lower heights. As with the two section ladder it must always be used with the extensions facing away from the wall. Multipurpose ladders –Multipurpose ladders consist of four sections that fold together concertina style when not in use. Unlike the previous models, these do not have a sliding mechanism as the sections are connected bytwo joints that can be locked in place at specific angles.At certain points in the rotation of thejoint a wedge shaped pin slots into an internal groove and then locks in place to give a solid,secure joint. As a result, this type of ladder can be assembled in a variety of configurations and function as astraight ladder, an articulated ladder, a double sided step ladder or a platform support. When using for the first time, make sure the stabiliser bars are fitted at either end.When the ladder is folded up the joints are locked in place and must be unlocked to extend it. Each joint has a catch on the side which can be pushed to the unlock position marked on the joint. This retracts the pin and allows the joint to move. When it reaches certain points on the rotation the pin drops into a groove and locks the joint at that angle. If this is not the desired angle simply push the catch to the unlock position again and rotate the joint further. Once the required configuration is reached, double check all joints to make sure they are fully locked and cannot move during use. To retract the ladder reverse this process. Telescopic ladders – telescopic ladders have many sections, each comprising one rung and two lengths of stile. When retracted the lengths of stile slide inside those of the section below, like a stack of paper cups. To extend the ladder stand it up on the ground and place a foot on the lowest rung. Slide the next section up and when fully extended and locked a green indicator will be visible on the stile. When the desired height is reached any unused rings will form a block at the top, it is not necessary to completely extend the ladder. The ladder must always be extended from the bottom up, if it is extended from the top the sections will not lock in place and the ladder will automatically retract. To retract the ladder, slide the two locking buttons on the second rung inwards using your thumbs, making sure your thumbs are not in the way of the descending rungs. The air inside the stiles should cushion the sections as they retract, slowing them down and reducing the risk of accidental injury. 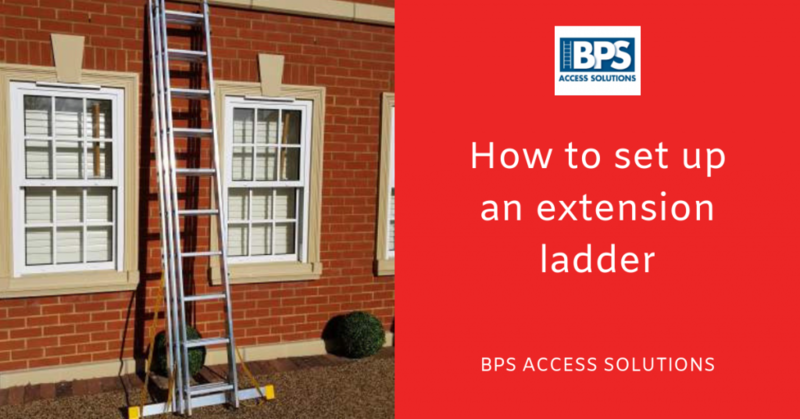 At BPS Access Solutions we stock all the extension ladders described above along with a wide range of accessories for increased safety and ease of use. All our extension ladders are rigorously tested to conform to the latest EN 131 safety standards and offer the best quality for price on the market. Our products all come with a lifetime guarantee and free next day delivery. If you have any other queries please contact our friendly, helpful staff who will be happy to help. PreviousWhat are the best ladders for decorating stairs and landings?